The purpose of this blog is to easily allow conservators who are involved with board slotting to exchange tips, techniques and other ideas that they have developed. The administrators of this blog are Jeff Peachey in New York City and Victoria Stevens in Oxford, England. Anyone who is involved with board slotting is invited to contact one of us, and we can register you as an author, which gives you the ability to create posts, edit them, and even delete your posts if you desire, which I hope does not happen! 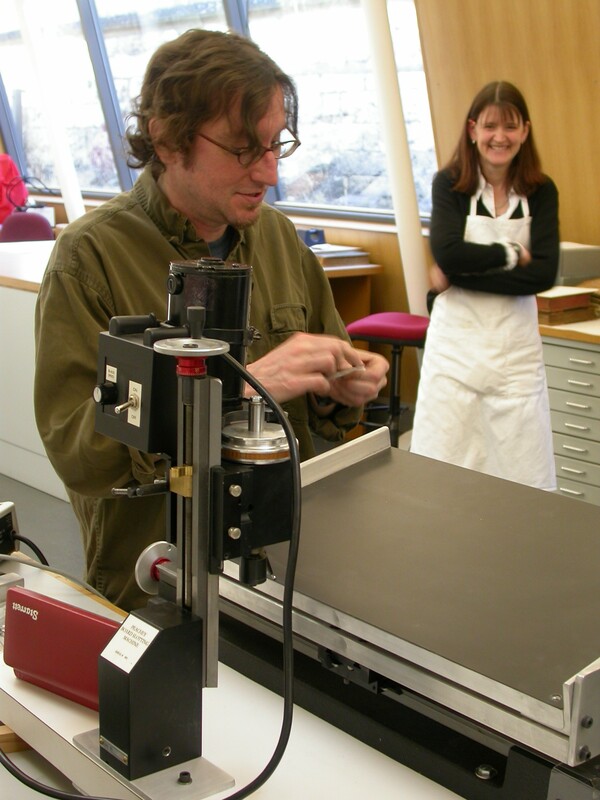 Jeffrey S. Peachey is the owner of a New York City-based studio for the conservation of books, and the maker of conservation tools and machines. He is a Professional Associate in the American Institute for Conservation andChair Emeritas of Conservators In Private Practice (2008-9). For more than 20 years, he has specialized in the conservation of books and paper artifacts for institutions and individuals. A consultant to major libraries and university collections in the New York City region and nationally, he has been the recipient of numerous grants to support his work. A well-known teacher, Peachey also provides conservation-focused guidance to students in art, archives, and bookbinding programs. He is also the inventor of the Peachey Board Slotting Machine. Victoria Stevens received a BA in History and Archaeology from Leicester University and trained in bookbinding at the London College of Printing, graduating in 2001. Since that time she has run a private bookbinding practice and from 1998 has been employed as a conservator of library and archive materials at the Oxford Conservation Consortium, a co-operative conservation studio offering programmes of collection care to 10 colleges of the University of Oxford and the National Trust. Victoria Stevens has a particular interest in books printed and bound post 1800 and their conservation. She is currently developing a board slotting programme with a view of implementing this treatment in the library collections in which she works. Recent major conservation projects have included the stabilization and protection of a collection of 19 sixteenth century parchment charters in their original boxes for St John’s College, Oxford. Laura O’Brien Miller is currently Conservator of Rare Books & Manuscripts for the Lewis Walpole Library at Yale University. Previously Laura worked as Associate Conservator for the Beinecke Rare Book & Manuscript Library at Yale University. Before going to Yale, Laura worked in Conservation at New York University’s Bobst Library, The Chicago Public Library, The Chicago Historical Society (currently The Chicago History Museum), and The Art Institute of Chicago. Laura is a Professional Associate of AIC, serves on the Book & Paper Group’s Education and Training Committee and is co-chair for the Archives Conservation Discussion Group. I am a second year student in the bookbinding program at the North Bennet Street School (NBSS). I am interested in book and paper conservation and finished a master’s degree in Library Science from theUniversity of North Carolina at Chapel Hill. In addition to my studies, I have worked as a graduate assistant in the conservation lab for special collections in Wilson Library at UNC and in the conservation lab in Perkins Library at Duke University. Last summer, I spent two months as a Lennox Foundation Intern in the conservation lab in the Parks Library at Iowa State University. You can read my descriptions of some of my projects on their preservation department’s blog. This summer I have been working on a few Historical Collections projects at Baker Library in the Harvard Business School. Abigail Uhteg is a pre-program book conservator at Columbia University and Paper Dragon Books in New York City. She holds a BFA in printmaking and art history from the Maryland Institute College of Art.